Being declared a semi-autonomous state in 1970, Meghalaya is now a fully independent state with Khasi, Garo and Jaintia hills newly being part of it. With Shillong being the capital, Meghalaya is also known as the Scotland of the east. It is a major center for trade with Bangladesh and has an agrarian economy which follows a matrilineal socio-political tradition. Meghalaya has been recently having trouble with illegal migrants and has made very unbending and stringent measures to fix this. Therefore, it is necessary for you to set up a rental agreement if you are planning to move in and reside in the place. 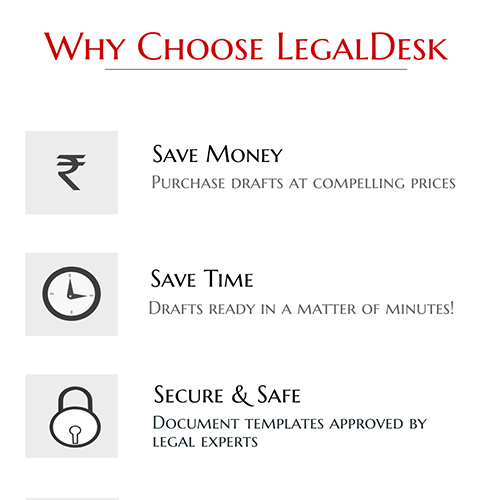 LegalDesk.com makes this much simpler and easier. While preparing a rental agreement, do keep the following things in mind. What Does A Rental Agreement mean? A rental agreement is a contract that is signed between the landlord and the tenant when the landlord decides to rent his property to the latter. This is a legal document which shows the consent of both the individuals regarding the rent/sale of the property. What Are The Procedures For Making A Rental Agreement? The details given below will make your work much simpler while making a rental agreement. Draft a document with accurate details of the landlord, the tenant and the property to be rented. You can personalise the document by adding clauses you find relevant and unavoidable. The agreement is to be signed by the landlord, the tenant and two witnesses. Get the contract registered with a sub-registrar office. Given above are the main steps that are to be kept in mind while drafting a lease agreement in Meghalaya. However, it is always better to have a conversation with the landlord and get to know his demands and needs before filing the clauses, so as to avoid any disputes in the future. The Meghalaya Urban Areas Rent Control Act, 1972, is the primary law governing the making of a rental agreement in Meghalaya. What Are The Essential Clauses You Ought To Remember? You can personalise your lease agreement by adding clauses that you find unavoidable if the landlord also agrees with it. It is always better to do so, as it serves as a guideline to your do’s and dont’s and also an insight to your privileges. Given below are few clauses that are to be added while framing your contract. Accurate details: The details given about the landlord, the tenant and the property to be rented should be true to the best of the knowledge of both the parties. Security deposit: This is a certain amount of money that the tenant pays to the landlord at the commencement of the stay. The amount paid by the tenant should be mentioned in the lease agreement as the landlord is applicable to pay back the whole amount to the tenant when the contract terminates. Notice period: This is the period of time before which the tenant has to inform the landlord about withdrawing the agreement. Lock in period: This is the minimum period of time before which neither the landlord nor the tenant is allowed to withdraw the lease agreement. Maintenance charges: The maintenance charges are to be met by the landlord unless specified otherwise in the contract. Pets: The agreement should mention if the landlord has given his approval towards keeping a pet in the residential premises. Visitors: The agreement should mention if the landlord has given his consent to allow visitors to stay on the premises. Rent: adding a clause about the rent would serve as a security to the tenant if the landlord decides to increase the rent unethically. Parking and other amenities: The contract should mention what are the amenities provided by the landlord. You can also add any other clause as per your requirement. 11-months agreement: An 11-months lease agreement is a short-term contract which is signed between the landlord and the tenant which terminates after a course of 11 months. The agreement can be renewed if both the landlord and the tenant wishes to do so. Long term agreement: Mainly used for residential purposes, a long-term agreement is a contract that is signed between the landlord and the tenant for a longer duration, which could be a course of 1-5 years, 5-10 years, 10-15 years and so on. Commercial agreement: This contract is mainly signed for business purposes where the tenant pays a lump sum amount of cash to the owner when the agreement commences. The tenant is welcomed to customise the contract by adding clauses as per the requirement of the business. What You Need To Know About Stamp Duty? Stamp duty is the amount that the tenant pays to the government to make the document legally valid. This is done by paying a specific amount while purchasing the stamp paper on which the contract is printed on. Stamp duty rates vary from state to state. The state of Meghalaya follows the Indian Stamp Act, 1899, for deciding the amount to be paid as the stamp duty. Why Is Registering Your Agreement Better? Registering your rental contract is always better because it makes the document legally valid. In the case of a dispute, a legally verified paper is preferred over the other. However, the process of drafting a lease agreement could be hectic, especially the registration part and this is one reason why people tend to opt an 11-month agreement over a long-term contract, as the former does not require registration. In India, notarization is mandatory only for certain legal documents. However, notarizing your document would give you an extra verification to the details given in the contract. Notarizing your document is a simple process, to do so, follow the steps given below. Customise the paper by adding clauses you think are relevant. The document is to be printed on a stamp paper of the recommended value. The contract is to be signed by the landlord, the tenant, and two witnesses. Take the document to a Notary public. State the need and get the paper attested by him/her. To form a rental agreement is a hard and tedious process. The stamp paper printing, the wait at the registrar’s office etc could take away the sunshine out of your days. LegalDesk.com has come up with a solution for this problem. You can now create a rental agreement online in a matter of minutes. To do so follow the procedure given below. Visit our page of ready to use online documents page and choose rental agreement. Enter accurate details of the landlord, the tenant and the property to be rented. Personalise your contract by adding necessary clauses. Print the document on a stamp paper of the recommended value or let us do so and deliver it to you. The landlord and the tenant have to sign the lease agreement to display their consent. The document also to be signed by two witnesses too. Take the contract to a Sub-registrar office and get it legally registered. From what’s mentioned above, you know that creating a rental agreement online is much simpler than the conventional method of doing it. It saves you from the startling process of deciding what clauses are to be added while drafting your agreement, the stamp duty rates, stamp paper value etc. We serve to make your lives easier and better. We have introduced various startup packages that you might be interested in. Do visit our website and enjoy the various services that we provide. There are 0 comments on "Rental Agreement In Meghalaya".